The second major airshow of the Shuttleworth Collection’s season was the “Fly Navy Airshow” celebrating over 100 years of Naval Aviation. 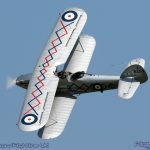 It promised to be one of the best shows at Old Warden in recent years with a large list of visiting acts to bolster the home team presenting a wide range of aircraft with naval links. 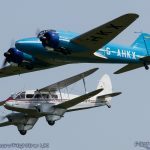 The Shuttleworth Collection has totally revamped and re-energised its airshow season recently with some very different events. The Fly Navy show was one of these new events and focussed on Naval Aviation. With a large number of visiting acts alongside many of the home favourites, the ground and air displays covered a century of Naval Aviation. Naval aviation got off to a somewhat faltering start in 1911 with the airship ‘Mayfly’ which never flew and broke-up on the ground. However interest in aviation remained and by 1914 both the Royal Navy and the British Army had their own air arms which fought throughout the First World War. In 1918 the RNAS and RFC were brought together to form the Royal Air Force on the 1st April. However, by 1937 the Royal Navy again had its own independent air arm with the formation of the Fleet Air Arm. This show turned out to be very special, not least because of the support from the Fly Navy Heritage Trust. The weather certainly helped out too. Despite being grey to start with, the weather could not have been better with clear blue skies throughout the afternoon flying display and a fairly steady wind right down the runway. Bolstering the naval theme on the ground were examples of modern day Royal Navy aviation. A Westland Merlin HM2 from RNAS Culdrose and a Westland Lynx HMA8 from 815 NAS, RNAS Yeovilton were on static display. The Merlin was part of the Royal Navy exhibition area in the paddock while the Lynx flew in late morning and departed during the flying display 700X NAS also had a display highlighting the Boeing-Insitu ScanEagle RPAS which is now being operated as a maritime surveillance asset from RN ships. The show opened with a flourish with the Shuttleworth Collection’s Hawker Sea Hurricane Ib flown by Chris Huckstep escorting the most potent aircraft in the show, the Fly Navy Heritage Trust’s de Havilland Sea Vixen FAW2. The formation then split and Simon Hargreaves in the Sea Vixen gave a very powerful “flat” display of flypasts making plenty of noise and wingtip vortices as he powered his way around the Bedfordshire Countryside. The star item formations didn’t end there either. While the Sea Vixen was displaying, the Sea Hurricane formed up with Air Leasing Ltd’s gorgeous Supermarine Seafire LFIIIc for another series of flypasts ahead of solo displays. Dave Puleston gave a wonderful account of the Seafire with slow flowing aerobatics and curved flypasts in the clear blue skies before heading home to Sywell. During the afternoon, the RAF Battle of Britain Memorial Flight put in two appearances. First was Flt Lt Andy Preece in the Hawker Hurricane IIc just after the Seafire display. Later, Group Captain Jez Attridge appeared in the flight’s Supermarine Spitfire XVI. The next visiting act then returned things to the 1960’s and the Cold War with Terry Martin displaying his Westland Wasp HAS1. As we saw earlier this year at Abingdon Terry puts on a superb display of handling close in to the crowd. Adding to the dramatic effect this time however were the clouds of cut grass thrown up into the air by the downdraft. There was a cavalcade of flypasts throughout the afternoon celebrating aircraft with links to naval aviation. BAE System’s Avro C19 Anson and an Old Warden based de Havilland DH89a Dragon Rapide represented some of the transport and liaison types employed by the Fleet Air Arm. Perhaps the most elegant formation of the afternoon marked the interwar years with Demon Displays’ Hawker Demon leading The Fighter Collection’s Hawker Nimrod I and the Historic Aircraft Collection’s Hawker Nimrod II. Though the Demon was not operated by the Royal Navy, the design was developed into the Hawker Osprey for the Fleet Air Arm. As well as appearing in formation, the Nimrod’s put on a lovely tail-chase while the Demon displayed as a solo. The Shuttleworth Collection can always put together an impressive gaggle of training types during its displays. Representing those of the Royal Navy were the de Havilland DH82a Tiger Moth, Avro Tutor, Miles Magister plus the de Havilland Canada Chipmunk T10 of the Royal Navy Historic Flight. The latter, flown by Lt Cdr Chris Gotke put on a magnificent aerobatic solo to conclude this segment of the programme. Completing the line-up of trainers was another interesting formation which saw BAE Systems’ de Havilland DH60 Cirrus Moth paired with Tony Whitehead’s Morane Saulnier MS315. The latter, which served as a training aircraft with France’s Aeronavale, certainly captured the attention thanks to its relatively large size compared to the Moth and some incredible agility as it snaked around behind the Moth. The Fleet Air Arm operated a very diverse range of aircraft during the Second World War and just some of these were represented during the afternoon including the Westland Lysander and Gloster (Sea) Gladiator from the Shuttleworth Collection. Kennet Aviation sent their North American Harvard III to mark the role this famous trainer played before and after the Second World War. Star though of this particular part of the display was the Royal Navy Historic Flight’s Fairey Swordfish making its first public appearance of 2016. An intrepid three-ship of World War One types represented the Royal Navy Air Service with the home based Bristol F2b Fighter and Sopwith Pup joined by David Bremner flying the stunning Bristol Scout re-production. The aircraft was built by David and his brother as a tribute to their grandfather who flew the Bristol Scout with the Royal Naval Air Service’s No 2 Wing in the eastern Mediterranean during the early stages of the Great War. Later this year the aircraft will head out to Greece to recreate his Grandfather’s flights almost exactly 100 years ago and will also overfly the Somme. The aircraft is the only Bristol Scout flying, and contains the only original Bristol Scout parts known to exist. The display at Old Warden was notable for David as it marked his first public display in the Scout. The final three aircraft in the display represented American derived Naval Air Power. The combine came from the Fighter Collection and consisted of the Grumman FM2 Wildcat flown by Dave Southwood, the Goodyear FG-1D Corsair piloted by Pete Kynsey and finally Brian Smith at the controls of the Grumman F8F Bearcat. After a formation arrival, each aircraft split and performed its own powerful solo display. Seeing such powerful warbirds over Old Warden is a rare treat and the clear skies certainly meant the pilots had the freedom to demonstration each type’s performance. In particular, the Bearcat impressed with its zooms climbs and high speed passes. While the three American types were displaying, a further formation of the Hawker Sea Hurricane and pair of Hawker Nimrods got airborne underneath to hold for the show’s close. This finale saw the three American types reform into close formation and together with the three-ship of Hawkers flew a number of passes as a “mini-balbo” to close the day’s flying display in the late afternoon light. Those that stayed behind a short while after the flying display had finished were treated to one final formation as the Yeovilton based contingent of Fairey Swordfish, de Havilland Canada Chipmunk and North American Harvard formed up over Old Warden park before heading home. 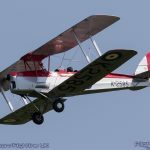 This was undoubtedly one of the very best air displays held at Old Warden in recent years thanks to some superb summer weather, great line-up and fantastic flying by all the participants. It just shows that a strong theme can really make a show stand out, particularly when it is presented so well. It was a memorable day and that was certainly reflected by the reaction of the crowd who appluaded so many of the pilots as the returned their aircraft to parking areas along the flightline plus some very positive post-event reaction on social media. We certainly hope that the Fly Navy event may well return in the future and will also encourage other similar shows celebrating other strong themes.